One last day in my four day weekend. I’m so sad to have to go back to work tomorrow. Yesterday, I did something fun. A few months ago, I was watching one of my Linda Taylor dvd’s of her PBS series, Linda’s Longarm Quilting. She had an episode on quilting vintage tops. That set me off on an Ebay binge…lol. I finally got an opportunity to work on one of them. Isn’t it a beauty? I tried to keep it as square as possible, but it is a little wonky. Now it goes on the WOB list (waiting on binding). I hope it also qualifies as part of my stash busting effort, as it was on the shelf with my stash, and I used backing fabric for my stash, and will use the same for the binding. Just look at all the beautiful fabrics in here. I love them! 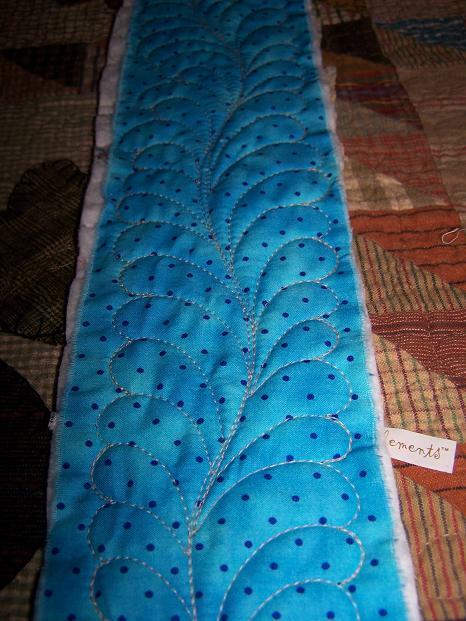 I used a repro backing that I got from Christian Lane Quilters. The story, from the Ebay lister, is that she purchased this top from an elderly woman named May, who she reckons to be in her 80’s. But get this…there wasn’t just this one top…there are two of these beauties! The tops were pieced by her mother, from May’s and May’s sister’s dresses. She said there was no one left in her family that would want them. They are from somewhere in Missouri. The seller had them listed separately, and I won them both. Here is the other top. This is a pic of the backside, showing all the handstitching. Now then, if you are reading this, and have fallen on the floor hyperventilating because I dared “machine” quilt these old tops, sorry, but you will have to get over it. I know there are some that are totally against this, but please save yourself some time and do not bother to send me flaming comments. I know, as a piecer myself, that if years and years down the road, some future quilter comes into possession of some of my unquilted tops, nothing would make me happier than for her to love them and finish them in whatever manner suited her. I think May’s mother would be tickled to see her projects finally finished, and know that they are in a good home where they are loved and appreciated. I had some spare backing and batting left at the bottom when I was done quilting, so just for fun, I pulled out a strip of scrap fabric and did a quick feather practice. Yes, yesterday was a good day! 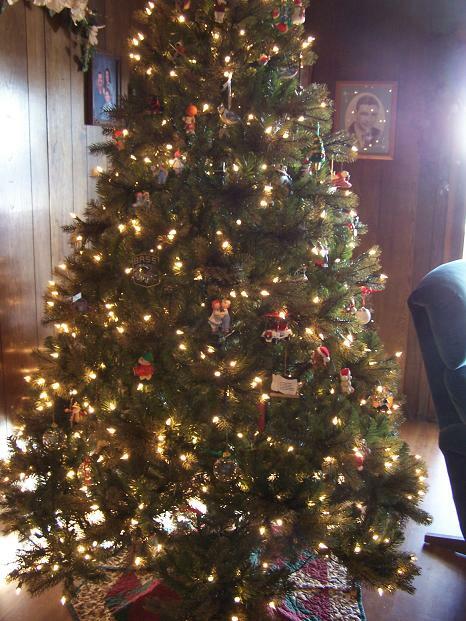 I got some of the ornaments hung on the tree, set out a nativity scene, and made more progress on my cousin’s binding. I hope your weekend is goind great, as well! 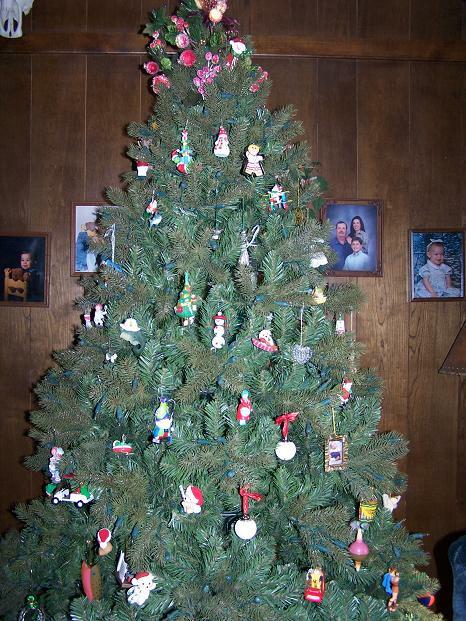 Even though I am not done decorating it, I will conclude this post with some pics of my tree and nativity scene for Kay. Also, on the stashbusting topic, I would like to add that I resisted the tempation to even go look at the end of bolt Thanksgiving sale at Thousands of Bolts. When I got the email, I deleted it and did not go shop for more fabric! 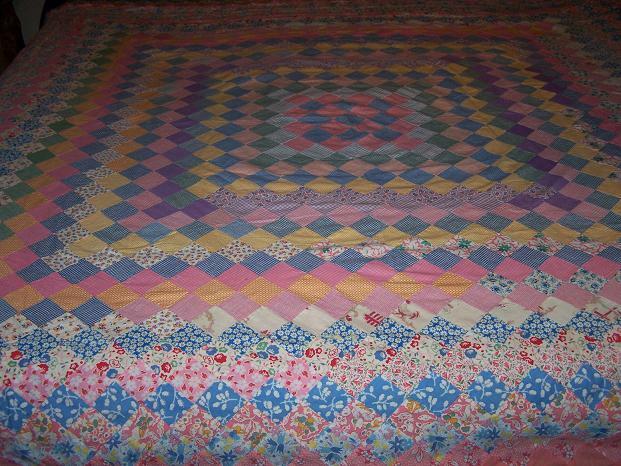 What a wonderful job on this quilt….. 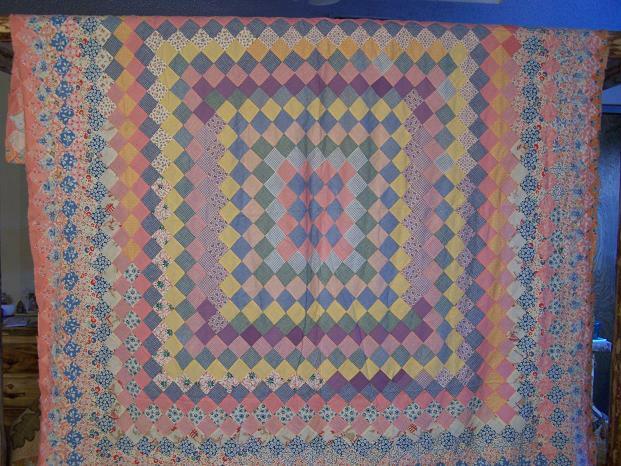 I get many of these to machine quilt, this turned out very pretty……. Christmas already, you are quite ambitious girl… Glad you are feeling better Randi, nothing worse than pain to get us down… Happy Holidays. I love that quilt done with the BF! I think a quilted quilt is always better than an unquilted quilt – no matter HOW it is quilted! I love the quilt Randi and I agree I would hope that eventually all my unquilted tops would be quilted and enjoyed someday. I have one more day left of my 4 day weekend…I really hope to get my Christmas/Winter wall hangings and decorations up too. I have an ebay find to that really needs to be finished, I think I should get that one out and done for the holidays too…time will tell. Love how that Ebay find turned out! Love it!! I’m in the finished is good crowd too! But I have yet to score an ebay top. Probably my lack of trying 😉 Enjoy your decorating time today!! I love it too Randi and hooray for you machine quilting it. Is the BF the Quilt EZ templates? 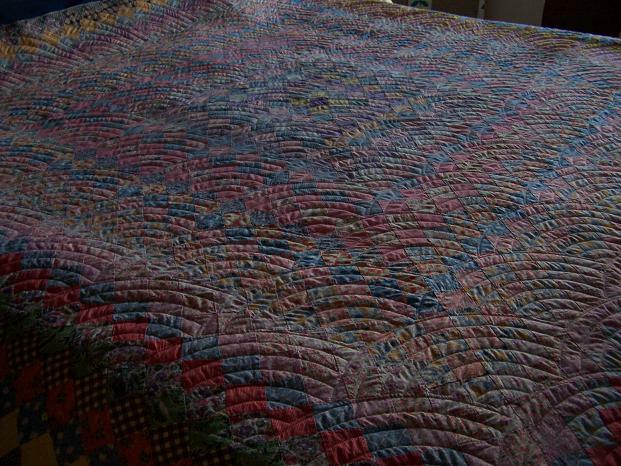 The quilt turned out great – I think it honors the piecer to finish it. 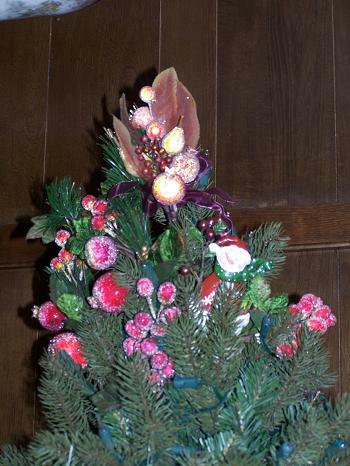 I began putting out my decorations yesterday, also. It took me several hours to set up my Dept. 56 O Little Town of Bethlehem. 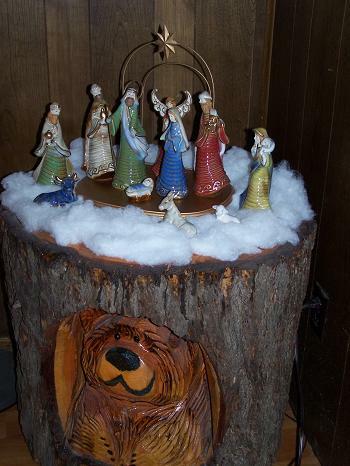 I love your nativity. BTW – is it still snowing up there? Thanks everyone! Yes, Freda, I used the Quilt EZ contemporary fan templates. Jan, it is melting off here today. It’s really pretty nice outside. Still chilly, but sunny. Randi, you have seen some of the vintage tops that I have quilted so you know where I fall in that argument. Quilted is better. It is less fragile and the quilt can be out and displayed rather than stuck away in a box in a closet. BF looks great on this! 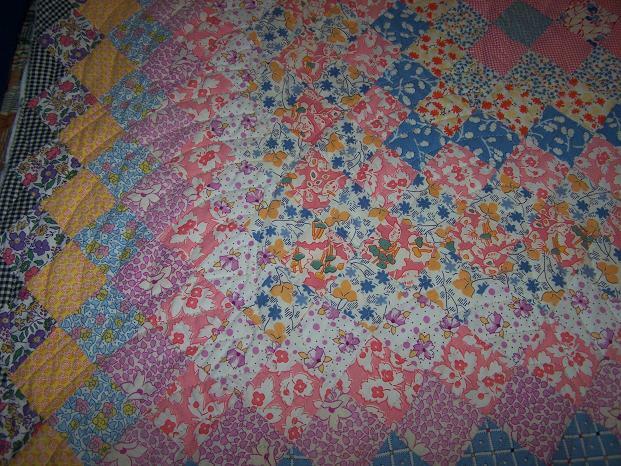 I love the quilts you won on ebay! 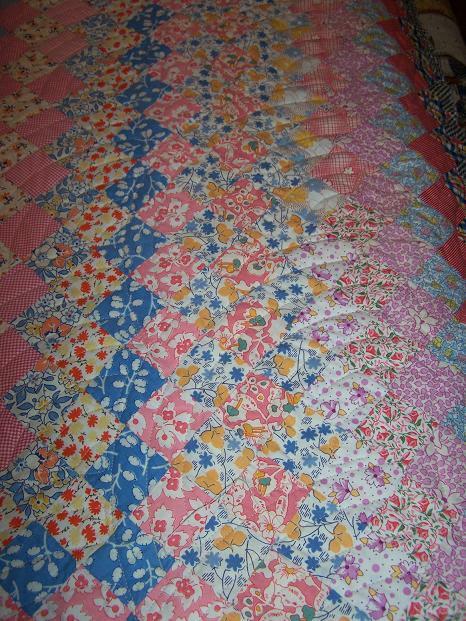 I bid on the old quilt tops sometimes too, but I try not to because they pile up (right along with the stash). Great job using that stash. 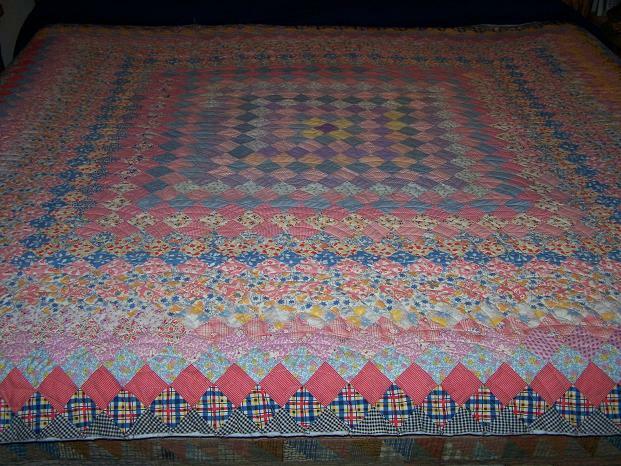 The BF looks great on that quilt Randi….and done is good, no matter how! Your feather practice looks good too. You’ve had a productive weekend! 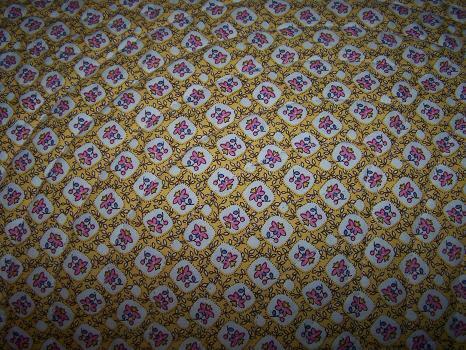 Randi – perfect quilting for a lovely quilt top. 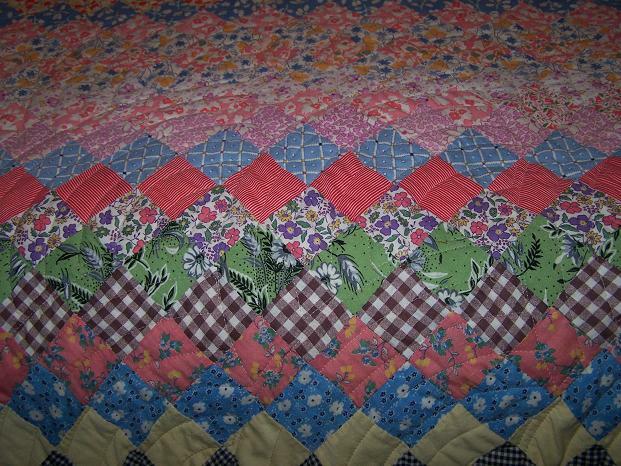 I just finished the last of three vintage tops I quilted for a friend’s grandfather. What a job the last one was! Yours looks much better than mine! Hi Randi, it’s Lisa from Quilting Friends. That is so neat that you won the quilts and finished them. And the story! What a wonderful thing to have a story for the quilts. They are great vintage fabrics and a record of what clothes where made of years ago. Good Job! 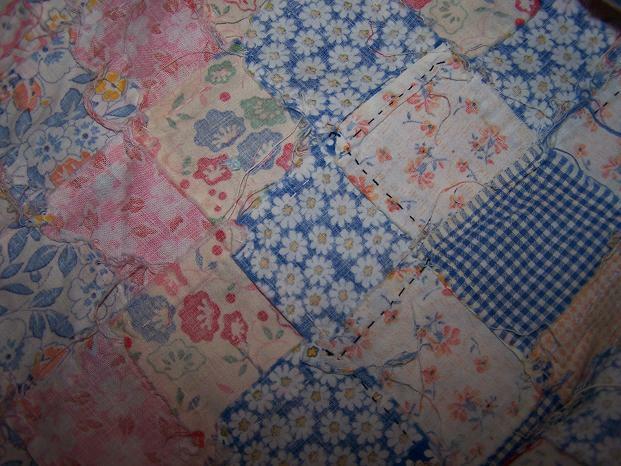 I have an antique quilt that my friend gave me. It was quilted and with no batting. I just love the quilt. I will have to put a picture of it on Quilting Friends soon. Talk to you later. « What’s on my bed?